When the inner corner of the eyes (epicanthal region) is covered with epicanthus, they look like a squint or crossed-eyed because they make both pupils look as if they are situated toward the inner corners. By magic epicanthoplasty, these problems can be corrected by exposing the corner of the eyes that were hidden by the epicanthus. These are cases where the upper pupils are covered by the eyelid skin drooping. 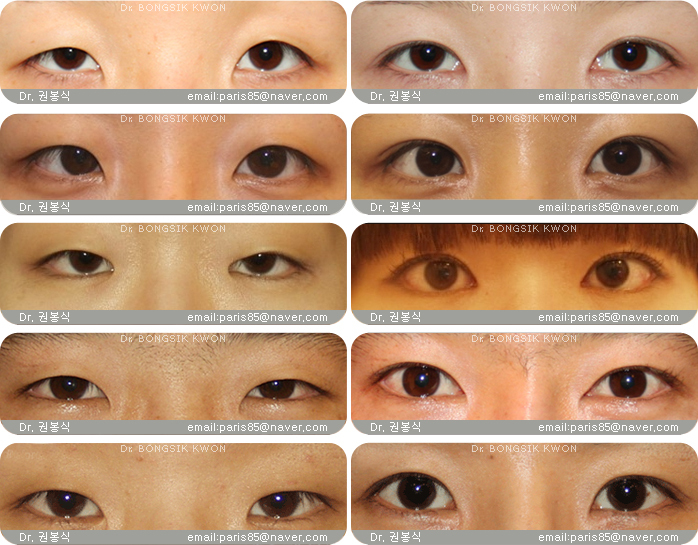 It should be separated from true ptosis or mixed type by accurate evaluation. In cases of much skin drooping(true epiblepharon), there tend to be more than mild ptosis. 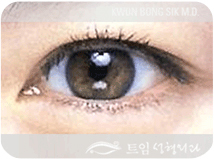 When the lower sclera of the eye is exposed, it is thought to give a gloomy-looking impression. In this case, it can get worsen if a lateral canthoplasty is undertaken so it must be avoided. Sometimes, it appears when one has true ptosis. When the lowerpart of iris is covered by eyelid, the eyes look small.It is usually due to hypertrophied lower orbicularis muscle. If the epicanthal tension is strong, it shows a diagonal pattern of the upper eyelid on the epicanthal region, covering the pupil at the same time. Magic epicanthoplasty can correct this unfavorable diagonal line by resolving epicanthus. It is generally known that the distance between two eyes should be the same as the horizontal distance of one eye, i.e. the distance between the medial to the lateral canthus. However, majority of Asian women have a wider interepicanthal distance because of the epicanthus. The ideal shapes of oriental eyes in numerical values are 1.2cm in height , 3.5cm from inside(medial canthus) to outside(lateral canthus), and 3.5cm between the two eyes(intercanthal distance). The angle of the medial to lateral canthus should be 10 degrees in upward inclination to be considered an ideal eye. 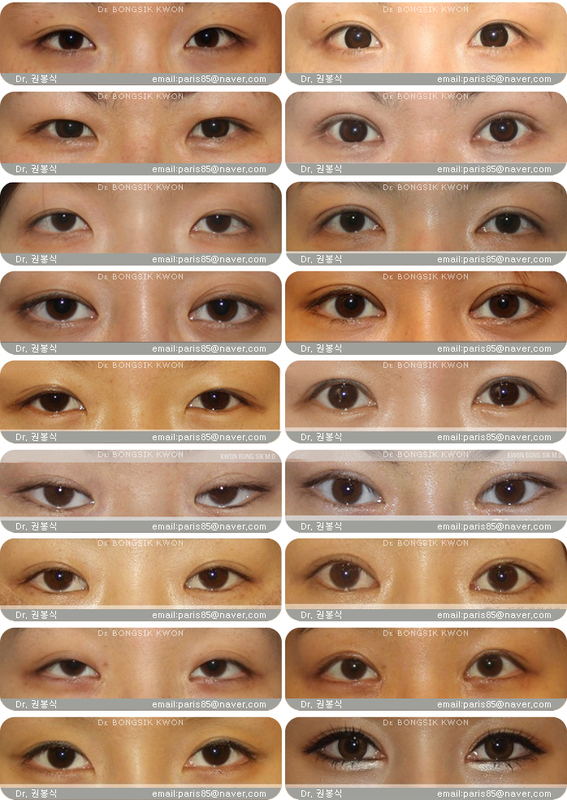 Compared with Caucasians, Asians have a laterally slanted shape of the eyes, which is called "Mongolian inclination". This is made by the structures called medial and lateral canthal tendons. An angle made by this line to a horizontal line of face is called an inclination angle. This angle is about 5-8 degrees in Caucasians, while Asians’ form an angle of approximately 10 degrees. The eyes will not look as good if the exceeds 15 degrees. In cases of severe Mongolian inclination, it makes a sharp impression and it can cause negative effects. Asians usually have sharp looking eyes compared to Caucasians because of the tail of the eyes’ inclination and epicanthus. As you get older, your eyes can change into a softer and more comfortable appearance because aging causes the upper eyelid to hang down. 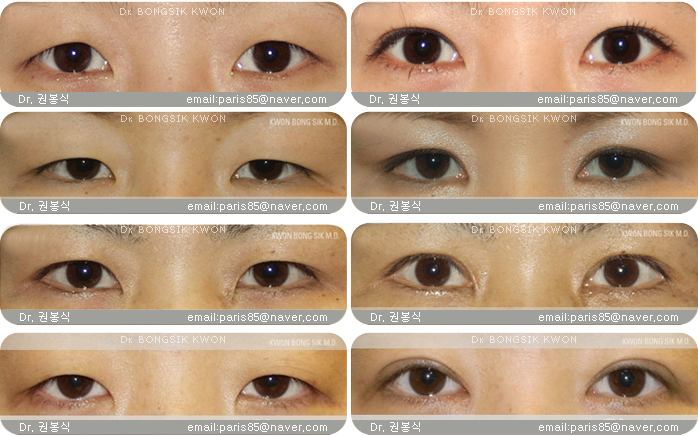 Examples) Double eyelid surgery combined with Magic epicanthoplasty in the eyes that hang down laterally. The fat tissue on the upper part of your eyes may sink in due to aging and can portray an older and tired appearance. To obtain a younger looking image, surgery using fat in the orbital area or transplantation of fat may be needed. Different images of eyes are created depending on the type of skin . This is an important factor to consider when performing the double eyelidsurgery. In a single eyelid, the eyelashes tend to point downward to the eyeball by being pressed down by the epiblepharon. As the forehead is raised for helping the eyes to open wider, the eyelashes will be inclined more to the eyeball side. In severe cases, it can damage the cornea sometimes. And also the older you are, the more severe the eyelash inclination is. 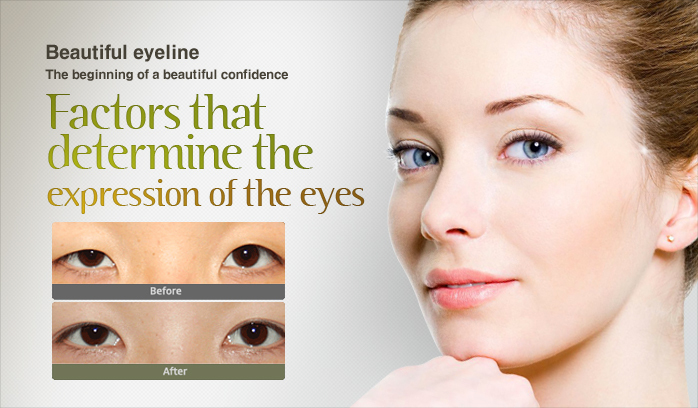 When a double eyelid is made, this problem of prickling lashes into eyes disappears because the lashes point upward. 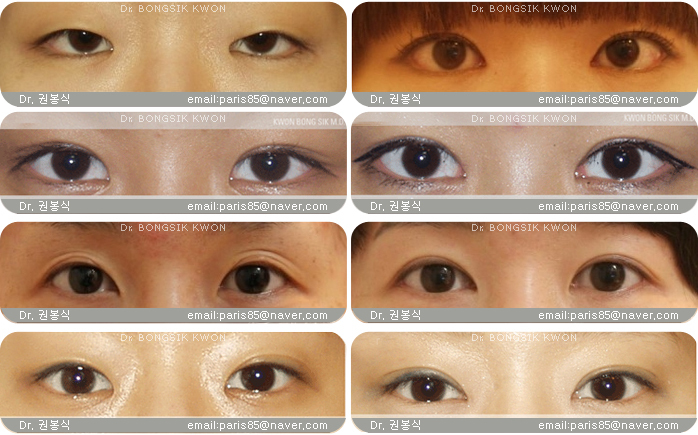 Examples)Magic epicanthoplasty combined with non-incisional double eyelid surgery and autologous fat injection in the protruding type of eyeballs. 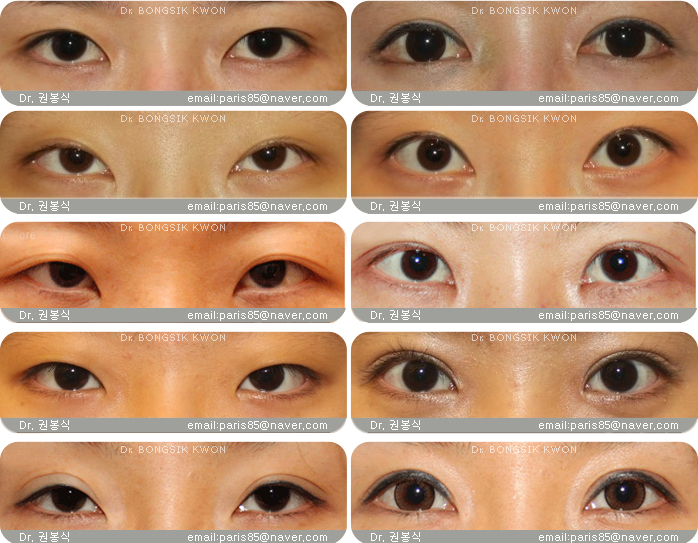 The protruded eyeball type is relatively favorable condition for formation of high, parallel crease in Asians. There is less soft tissues which is displaced and malpositioned. Also the epicanthus tend to be not severe. Examples)When the distance between the eyebrow and the eye is short, it may give a puffy look. Examples)When the distance between the eyebrow and the eye is far enough, the eyes give a brighter image. When the distance between the orbital skeletal structure is far, then the pupillary distance also widens. In this case, it is impossible to make orbital skeletal structure narrower, but augmentation rhinoplasty can sometimes be helpful for changing the image of the face. The epicanthoplasty would be helpful according to the degree of epicanthus. This is a case where the distance between the inner parts of the eyes looks farther than the actual distance because of the epicanthus. Magic epicanthoplasty can correct this specific condition. With the combination of the above two factors, the interepicanthal distance looks far from each other. Both augmentation rhinoplasty and magic epicanthoplasty can improve this condition. In cases where the interepicanthal distance is narrow, epicanthoplasty could cause worse effects. 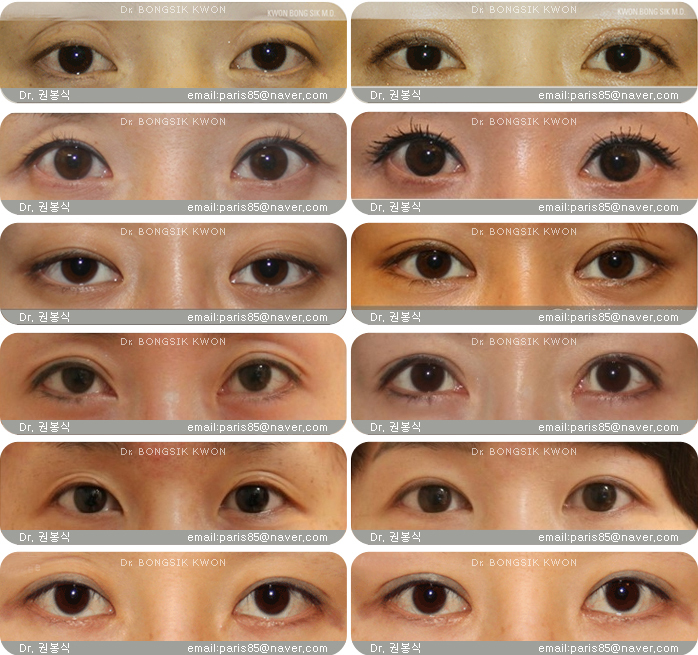 Only the double eyelid surgery must be performed.